Michigan receiver Roy Roundtree moved from the slot to split-end last year, and he suffered the worst drop in wideout production in school history. Now he's on the move again, after offensive coordinator Al Borges announced Monday the senior is moving to the flanker position that was occupied last year by top wideout Junior Hemingway. Only, this time, Borges expects Roundtree's numbers to spike in the other direction. "Because we split time with him and Jeremy Gallon (last year), Roy took some hits with his numbers," Borges said. "But going to flanker, a healthy Roy Roundtree could really have a good season. "And out at flanker now, you get more balls thrown your way. I have no doubt Roy Roundtree will have a heck of a year." 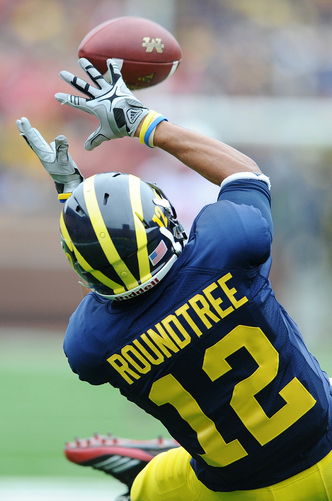 Roundtree led Michigan in receiving as a freshman, then exploded in 2010 as a sophomore, when he hauled in 72 catches for 935 yards and seven touchdowns. Roy Roundtree caught 72 passes as a sophomore but just 19 in his junior season. He's expected to increase his production this year when he moves into Junior Hemingway's vacated flanker position. As a junior last year, though, he caught just 19 passes for 355 yards and two touchdowns. That's the worst season-to-season dive in Michigan history. Borges never expressed concern about Roundtree's production last year, typically ascribing the decline to the growing running threat of quarterback Denard Robinson and tailback Fitz Toussaint. Both posted 1,000-yard rushing seasons. But Roundtree often disappeared from games, and his rhythm with Robinson never really hit a groove. That will have to change next year, when the Wolverines lose their go-to threat in Hemingway. That is a key loss to a passing game that already ebbed and flowed. Can Roundtree fill the void? "He's had such a great attitude," the second-year coordinator said. "He did take a hit with numbers and it would be natural to second-guess a lot of things, but he didn't. And because he didn't, he's improving daily." While Roundtree is Michigan's most important player at receiver, the team also is searching for a third starter to play alongside him and Gallon. After two days of spring practices, Borges seems particularly high on Jerald Robinson and already has compared him to Hemingway. "Jerald Robinson, in two days, has been very impressive," Borges said. "He's a big, physical receiver, very much like Junior. Not quite as big, but still big. Has excellent hands. "Ran on the scout team quite a bit (last yaer), not because he wasn't good enough to play -- he was good enough to play -- but we were pretty good at wide receiver and never really got a chance to use him." The sophomore form Canton, Ohio, did not record a catch in two games at receiver last year, but Roudtree said he was one of the more impressive wideouts of camp last fall. He also would bring some size to the position at 6-foot-1, 206 pounds. Roundtree is 6-foot and Gallon is 5-8. "Jerald is going to get a great look, and so far, what we've seen, he's going to make a contribution," Borges said. And he is that big, physical guy much like Junior was. You ask how to replace Junior, and he's definitely at least one answer." Jeremy Jackson is expected to be Robinson's biggest competition for the third spot, although he was not mentioned by Borges on Monday. Incoming freshmen Amara Darboh and Jehu Chesson also could be in the mix when they join the team in the summer. Wed, Mar 21, 2012 : 6:21 a.m. The mug is round. The jar is round. They should call him Roundtree. Tue, Mar 20, 2012 : 9:39 p.m.
Tue, Mar 20, 2012 : 6:15 p.m.
Only 19 passes, but some beauties - especially in the corner of the end zone vs notre dame. I said earlier this week, I like the way Borges thinks and that is he is always 'thinking' and never assuming or never satisfied - wouldn't want it any other way. MgoBlueForTiM....grateful but not assuming. Tue, Mar 20, 2012 : 3:10 p.m.
What ever happened to Ann arbor native 6'2 Ricardo Miller? He was rated as high the 27th best WR in the country in 2010 by scouts. 5'10 Drew Dileo, 4 inches shorter and 35 lbs lighter -ranked 101 by the same service is always on the field. Tue, Mar 20, 2012 : 4 p.m.
Miller was switched to TE a while ago... he will be competing for a starting TE spot this year. Tue, Mar 20, 2012 : 2:41 p.m.
Am glad to know that the coaching staff has confidence in Roy Rountree. It woudn't surprise me if he does as well as he did in 2010 or better. Tue, Mar 20, 2012 : 6:17 p.m. I agree and could see him taking control (#1 jersey still in storage). Tue, Mar 20, 2012 : 11:10 a.m.
Tue, Mar 20, 2012 : 4:02 p.m. I think that only real worry is depth. It seems like we have more scholarship RBs than WRs at this point. But the way Hoke is recruiting, hopefully depth at WR won't be an issue for long. Tue, Mar 20, 2012 : 10:38 a.m. I don't think the WR position is too much of a concern.We've had &quot;break-out&quot; players in the previous seasons. Most notably, RR in '08 &amp; '10, and Hemingway last season. Granted, we haven't had the big time production of years past but I believe we're gonna continue to make great strides this season and years to come. Tue, Mar 20, 2012 : 6:20 p.m. Sorry - 'bad time to be north and south'....they use to have a delete and correct button ! Tue, Mar 20, 2012 : 6:18 p.m. Yes, and times are changing for the good - great time to be a Wolverine - but time to be north and south of here !